With a whopping 7,300 in attendance, Cage Fury Fighting Championship 5 holds the distinction of being the biggest Northeast regional show ever - and that's due in no small part to the man pictured above, who was lured into the cage to take on former boxing champ Ray Mercer for his very first MMA bout. The June 23, 2007 CFFC installment had it all. On the undercard, there was Lyman Good, Nick Serra, Jim Miller, Deivadas Taurosevicius, Kevin Roddy and Gregor Gracie, and in the main event... KIMBO SLICE. Every day, millions of tourists flock to Times Square like moths to a flickering neon flame, attracted to the never-ending activity, the ebbing and flowing tides of strangers, and the countless costumed cartoon characters flaunting copyright laws. But yesterday, those who visited the center of the New York City universe were treated to something spectacular. 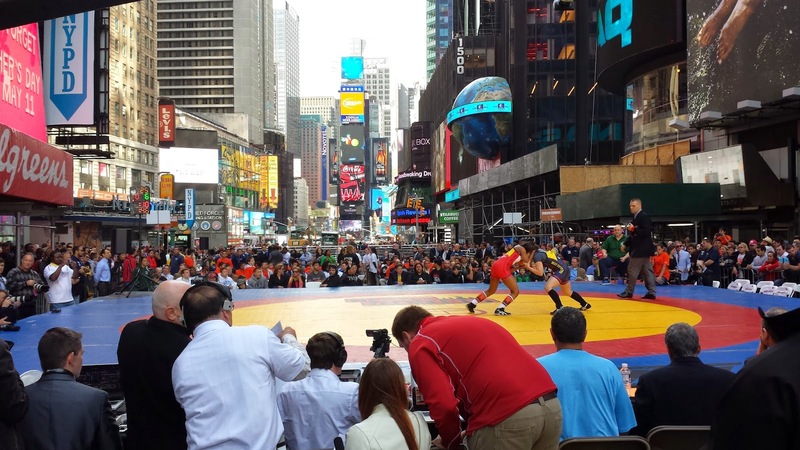 That's right, I'm talking about Beat the Streets, which for years has been assembling teams of top-level American freestyle wrestlers and pitting them against a field comprised of the international elite.